The Indian court decision on Rumtek! As they say it’s never too late to think and understand the truth. Indeed, the time is ripening for the truth to come out.It has been the trait of the traitors to get personal with allegations to hide the lies they have been feeding people. But naïve people who support them are so blind that they have lost their own ability to scrutinize the facts and find out the accurate answer. They have missed out on the first principle of Buddhism itself and shamelessly repeat the lies they have been fed without properly investigating the truth.It has been quite some time that the people of Nalandabodhi and their associates have been feeding the entire world with baseless allegations and blatant lies. But this can not go on forever.As they have alleged that Shamar Rinpoche is jealous of Situ Rinpoche… But the fact remains that about two hundred years ago during the time of the 10th Shamarpa a ban on the line of reincarnation was imposed by the Ching Emperor of China. 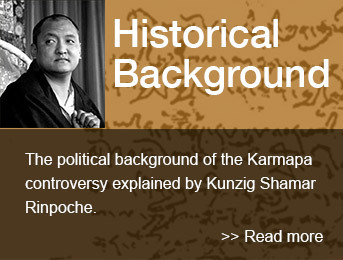 But this was only until 1963 when late 16th Karmapa recognized the present Kunzig Shamarpa enthroning and endowing him with the position as well as the authority that he once had. An interesting point here is that there is no need for him to be ‘jealous’ of Situ Rinpoche but in fact this applies now to Situ Rinpoche since he no longer enjoyed the status and authority that he would have held in the absence of the Shamarpa. As it is, the ranking of the reincarnated lamas has been clearly written by the late 16th Karmapa which is indisputable. If one looks at the history, even then, the allegations of being ‘jealous’ would be unfound because the 10th Shamarpa was a staunch disciple of the 8th Situpa. Added to that the 10th Shamarpa was recognized, taught and enthroned by the 8th Situpa. So how could the Shamarpa be jealous of the Situpa when he was the ambition of Situpa for the Kagyus. At no point has the Shamarpa stated anything bad about the Situ Rinpoche. It’s just the style of the traitors, when they want to do something mischievous they blame it on someone first and make way for themselves to do the same. This is how these people have misled the naïve people of the west. Another occasion when this allegation was raised was in an article in the New York Times where the Cultural Secretary of Sikkim whose name is Tashi Densapa had mentioned the same. But the fact overlooked and hidden from the world was that he is the step-uncle of the boy called Gyaten Tulku which, the Shamarpa did not approve. So, he had his reason that was made full use of by Situ Rinpoche and his people. Regarding the recognition of Ugyen Thinley as the Karmapa, Shamar Rinpoche has never commented negatively about this innocent boy. He has always stressed in his statements that he does not want to attack an innocent boy who is being used by people for their personal benefit. Relating to Ugyen Thinley’s recognition, three solid reasons can be seen for Shamar Rinpoche not accepting him as the genuine Karmapa. Firstly, Situ Rinpoche forged a letter which, till date he resists from being taken for a forensic test. Apart from that, the content of the letter revealed that Ugyen Thinley is the Karmapa and Situ Rinpoche as his guru. Shamarpa had on many occasions advised Situ Rinpoche not to publicize this letter in which the signature had been smudged with water in order to hide the fake signature and the handwriting was of Situ himself, since it would bring harm to the Kagyus as well as Situ Rinpoche himself. But Situ Rinpoche hand in hand with Gyaltsab Rinpoche and their political allies chose to betray the 900-year-old Karma Kagyu tradition. All this they did to gain credibility from the Chinese Govt. and the Govt. of the Dalai Lama. Secondly, this boy Ugyen Thinley had already been recognized as Kalep Tulku by Khamtrul Rinpoche prior to being recognized as the Karmapa. This Lama in his previous life was the uncle of Ugyen Thinlay’s father. This is a fact that has always been hidden. If he was the Karmapa, then there should have been incidences of self-recognition as in the case of the previous Karmapas as well as Thaye Dorje. How could the Karmapa be confused with an ordinary monk like the Kalep Lama. Thirdly, this changing of Ugyen Thinley into the reincarnation of the Karmapa from Kalep Lama was solely political. In retrospect, this came about when the Chinese government wanted to install the Panchen Lama. But prior to this they wanted to start with the Karmapa. So, pressure was mounted on Situ Rinpoche with the lure of personal benefits to install a Karmapa as soon as possible. Situ recommended Ugyen Thinley to become the Karmapa since he had the eyes similar to that of the previous Karmapa. Not only that he was always looking for a child from a low family that would match the status of the family that Situ came from. Hence, Situ Rinpoche and his associates along with the Chinese Government recognized him as the Karmapa. All the details of this incident are available with the Chinese. The monastery of Khamtrul Rinpoche was forced to accept this change by the Government of China. This was treachery at its best from the part of Situ Rinpoche. Since this time onwards Shamar Rinpoche has not agreed with any activity of Situ Rinpoche and his followers. But in order to avoid the physical attack and in order not to damage the life of Ugyen Thinley, Shamar Rinpoche agreed on Ugyen Thinley being enthroned in Tibet only. Later Shamarpa himself wanted to look for the genuine Karmapa and enthrone him according to the Kagyu tradition in India which, he did after overcoming many obstacles. As one can clearly see Shamar Rinpoche has never attacked the innocent boy Ugyen Thinley. Unlike the people behind this innocent boy like Situ Rinpoche, Gyaltsab Rinpoche, Trangu Rinpoche, Lama Tenzingla of Woodstock, the Joint Action Committee of Sikkim and many others have attacked physically the innocent Thaye Dorje when he was 11-year-old. On top of that due to political reasons he was insulted and the attack on him was also hidden by people like Patrick E. Cole/Los Angeles and Jefferson Penberthy/New Delhi in their article of May 02 of 1994 of the Time magazine edition. Shamar Rinpoche has not on any occasion accused Ugyen Thinley for being fake or genuine. He has only tried to subdue the wrong doings of Situ Rinpoche and his followers. All he is doing is trying to save the age-old Kagyu tradition from the hands of traitors. This is the time for people to have proper judgment and not be naïve. The naïve people have always been led with lies like a flock of sheep. I think people are wise enough to differentiate between black and white.